Hire Santa is delighted to supply you with other Christmas characters to bring even more Christmas Magic. Why not hire Mrs Claus – also known as Mother Christmas and Grandmother Frost. Mrs Claus can come as an addition with our Celebrity Santa, Movie Santa or Canadian Santa or on her own. A delightful character, very motherly, gently and warm - always a great hit with younger children whom she can entertain brilliantly. Hire Santa is really pleased to introduce you to our Miss Claus and Miss Elf, both characters with bright, enthusiastic and bubbly personalities. We only hire special actresses and performers for all our female characters. Hire Miss Claus for promotions or as Santa’s helper. Hire Miss Elf also for promotions, storytelling and many more exciting projects. Elves (also known as gnomes or elfin) are a great addition to the team at Hire Santa and available for your Christmas events. Elves come in giant size or pint size, male and female and bring fun and laughter with their crazy antics. 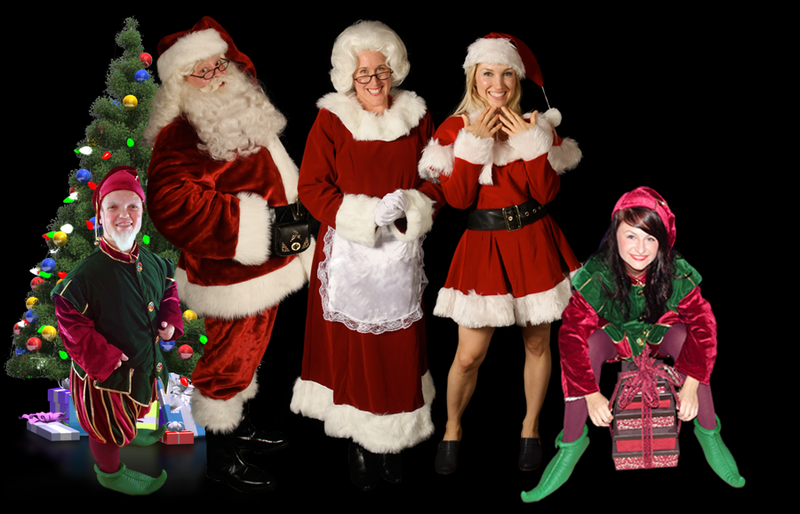 Hire Mrs Claus, Miss Claus, Miss Elf, Tall Elf and Small Elf or any other Christmas entertainment – Costumed Characters, Stilt Walkers, Balloon Modellers and Storytellers etc. for all your corporate event requirements. Hire Santa only provides you with the very best in entertainment and wonderful costumes and all our professional actors, actresses and performers have clean fully enhanced DBS (CRB) certificates and public liability insurance.